I have a houseplant vine and would like to find out the name. You are killing me here, I had one of these beautiful plants for years and yet I can't for the life of me think of the name. I will call my sister and get it as we both had the plant, litterly the same plant. It got so big I couldn't take it with me when we moved so she adopted it. I would love to have a start again. Thanks for the 50 year old memory! Aha just thought of it Hoya plant I believe if memory serves my right. 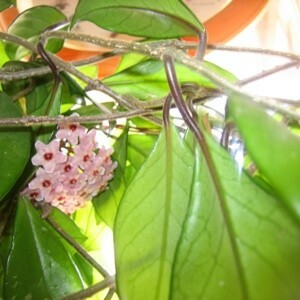 Yes, my mom says it is a Hoya plant. Do the flowers smell real sweet? Hers was clear up the wall and across the ceiling when she moved. If you cut it, just put a piece in water and it will take root. It loves the sun and will grow better if it's in it. She says it takes awhile to root. It is definitely a Hoya. I love them. I have two different varieties than that one. One has very curly leaves and the other has very small pointed leaves. The flowers are all the same though. I have also heard them called Wax Flower plants. They grow very easily from cuttings. Hoya is the correct name. Just went to a nursery and they gave me the same name. How do I take my request off your site? Editor's Note: Donna, the request will stay up, for other people who might be asking the same question. I have removed your alerts so you won't get emails anymore. I have a plant like that and have always called it a rope plant.